I’m pretty sure most people out there already know what a “Trunk or Treat” is. 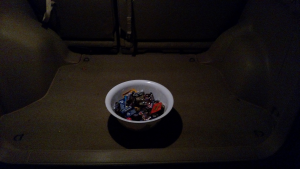 But just in case you don’t, I’ll explain: a “Trunk or Treat” is when children are taken to a specially chosen parking lot (usually at a town hall, church or shopping area) and go from vehicle to vehicle to collect their treats. Sometimes other activities are available, like bounce houses or face painting. Why do this instead of regular trick or treating? Apparently supporters of this practice think it’s safer for children this way. Thankfully not everyone who attends these events fits into that particular category. Many take their kids trick or treating as well, with the “Trunk or Treat” just being a way to get extra goodies at a social event. It even makes sense to do it in rural areas where the houses are too far apart for traditional trick or treating. My problem is the people who want to replace trick or treating entirely with this concept. I have also heard concerns online from those who fear their local government will do just that, apparently since people often have to pay for parking spaces and admission at these events. Thankfully, I could find no hard evidence and suspect this is about as likely as finding (non-hoaxed) razor blades in apples. But sadly any look online or in the editorials section of your local newspaper will show there are people who would prefer trunk or treating to be the only game in town. In addition to my points about their alleged “safety,” I feel such events make Halloween less special for children and their families. Take a look at the picture used in this article. While my staged recreation of a lazy “Trunk or Treat” in this article is thankfully much less common than it was in the early days of the concept, it still illustrates how a car can never truly replace a house. I’m always happy to see those who go the extra mile by decorating their vehicle. But a decorated car can never replicate the experience of a lavished decorated home or yard haunt. Even if a “Halloween alternative” was held in a building so kids could still go from door to door, it just wouldn’t be the same. The practice of home haunting would also wither, if not completely die out, without trick or treating. Nobody wants that. Less space for decorations and less home haunts means less purchases. In other words, the economy will take a hit. So feel free to trunk or treat. Just don’t try to make it the only option on Halloween.